Yesterday I just about had an anxiety attack in my office when realization washed over me that I’d made a really stupid mistake. A week or so before, after playing around with different wording and designs for weeks and fiddling with the excel sheet address list, I got the final thumbs up from Mumbles and placed the order for his 30th birthday party invitations. Only yesterday did it hit me that I ordered more than twice as many invitations than I needed. Such a waste of money! What was I thinking?! I can’t believe I did that! Apparently I was focusing more on the total guest count instead of the number of addresses, and since most of our guests are part of a family or couple, there are way more names than addresses. I can’t believe I made such a bonehead move. I was feeling awful and mortified and like a complete idiot so I called Mumbles knowing he’d make me feel better. His response? “Awesome, we can invite more people!” While I’m over here writhing in discomfort and agonizing over this petty mistake, he’s over there like “lemons and lemonade, baby.” Okay, he totally didn’t say that, but I’m just still always so surprised by how consumed I am by this sort of thing – in my eyes it’s such a disaster and failure! – and how trivial it is to him in contrast. So much so that he can easily brush it off and console me and forget the whole thing ever happened. Which is just what I needed. Buuuut, this whole debacle reminded me that I also once forgot to list the time for BFOTBM’s baby shower. Doh! Apparently I can’t be trusted to order invitations. Remember that. I sure do. The interesting result of that snafu was that I received the most responses (and prompt too!) I’ve ever gotten for any party I’ve hosted. No one RSVPs these days. Want them to RSVP? Don’t put the party time on the invites. People call and email right away to get that info. Consider that a new insider trick — you’re welcome. Someone please tell me I’m not the only one that makes these goofs. What silly mistakes have you made lately? P.S. Fun party themes & ideas. 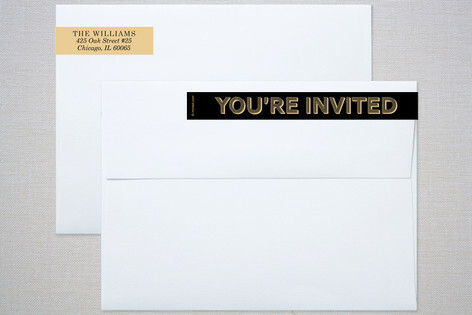 Photo of invitation suite envelopes by Unless Someone Like You for Minted.